Okay, I’ll do my best to stay focused and stay on the topic at hand. I have an extreme passion for Football, specifically College Football to be exact. I’ve been contemplating for the past couple of weeks on doing a post for this specific topic, but my answer was solidified when I watched an episode of “Friday Night Tykes” on the Esquire Channel today. I understand in the Lone Star State, football is very important at ALL levels, but when is or better yet, what age is TOO early for children to play tackle football? Watching this show, I feel guilty, because I have a passion as some of the Coaches on this reality show, but are you willing to jeopardize the future of a young athlete just because you’re the Head Coach and you want to win? I, myself, personally don’t want to be labeled as “that” coach, who was the cause for a player being paralyzed or possibly dying on the Football field. I also realize that kids can get hurt at school just as easy, but I feel you increase their chances by letting them play tackle football at 7, 8, 9 and 10 years of age; kids mature at different times, so who makes the final decision? Instilling discipline into a young player can be done without contact. Who should make the final decision on when children are allowed to play Tackle Football? The Parents? Recreation Directors? Parents will win the majority of the time, because if you don’t let them play “here”, they’ll go over “there” and play. Concussions are real and they exist, but most of the parents seem oblivious to this fact, because they say, it won’t happen to my kid. Until, it does. Some people say my answer would be different if I had a son of my own. No, I don’t think it would. Real quick, lets look at the definition of Concussion. A Concussion is (1) temporary unconsciousness caused by a blow to the head. The term is also used loosely of the aftereffects such as confusion or temporary incapacity. (2) A Violent shock as from a heavy blow. Acceleration (G-Forces) can exert rotational forces in the brain, especially the midbrain and diencephalon (the caudal [posterior] part of the forebrain, containing the epithalamus, thalamus, hypothalamus, and ventral thalamus and the third ventricle). 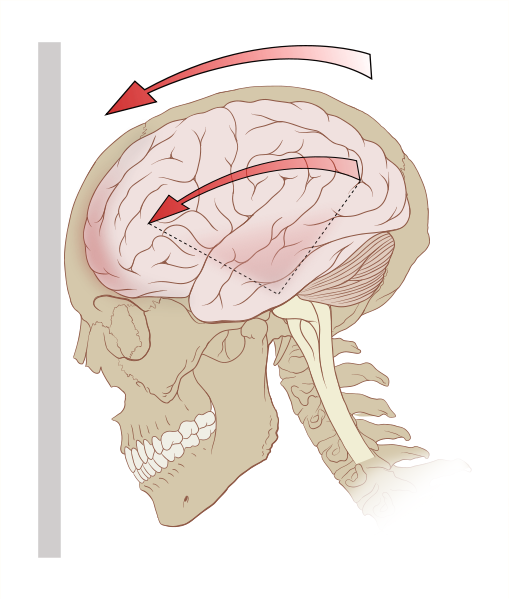 Traumatic Brain Injuries (TBI) exist because of blows to the head. It can happen on their 1st hit or 2,000th. Playing tackle football is an extreme risk, due to injuries other than concussions. This issue has also sparked a debate at the National Football League (NFL) level of play. It has caused family members and former players to sue the NFL due to the lingering affects of multiple concussions. I’m not trying to spark a debate, just asking the question of if this is how you want to instill “discipline” into young players? There are other ways to do this. I think it should be based on the maturity level of the child and the Parent & Recreation Director should talk it over before making the decision. If the parent decides to let their child play tackle, they should have to sign a waiver, stating that if the child receives a concussion, the Recreation Department will not be held responsible, and by signing the waiver, the Parent acknowledges that they understand the risks associated with playing tackle football. This also would protect the Recreation Department against law suits. Maybe the National Football League (NFL) and Collegiate Football should incorporate the waiver so in the end, when the player is done playing football, they can’t sue the University or the Professional Organization, whether it be the NFL/CFL, etc. I truly believe that education is the key. Before having the Player/Parent/Recreation Director sign off, conduct training so they know the effects from a concussion, also show the Parent and Coaches what could happen if they don’t deal with concussions the correct way. Don’t overlook the signs, because you want to win. Hold the Parents, Coaches and Players responsible. I know that we can be hurt getting out of the bed, but that’s a risk that we have to make. Maybe I’m looking too deep into this issue. I don’t know. After saying all that, I strongly feel that based on maturity, size and mental stability of the Parent/Recreation Director/Player, then should the decision be made. Parents don’t look at the present, they are focused on the future, what the player could possibly do at the next level. They forget about the maturity and all that other stuff. How do you feel about it? Hello friends, its impressive post concerning teachingand entirely defined, keep it up all the time. over the web without my agreement. Do you know any techniques to help reduce content from being stolen? I’d truly appreciate it. Thank You very much. I appreciate the support. Sure. You are welcome to share my Blog. Thank you for your support. to your site? My blog is in the exact same niche as yours and my visitors would genuinely benefit from a lot of the information you present here. Sure that’s fine as long as I get some credit. I worked very hard on it. If you wish for to obtain a good deal from this article then you have to apply such methods to your won weblog. a blog that’s both equally educative and entertaining, and let me tell you, you have hit the nail on the head.